An industrial tricycle is simply an adult tricycle that has been seriously beefed up to handle larger carrying capacities. 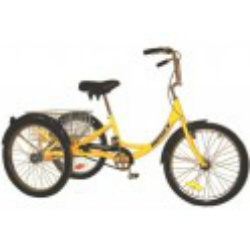 Not everyone that rides, or would like to ride, can find a bicycle or tricycle that is rugged enough. 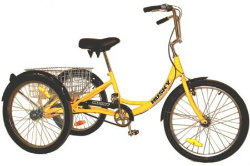 The tricycles shown here are significantly larger than any standard adult trike and, in fact, use 24” or 26” wheels more typical of a bicycle. Although they are designed for industrial applications there is no reason they should be restricted to the factory floor. Large people need exercise too and cycling is an excellent way to trim off some lbs. Obviously, they should clear it with their doctor but cycling is easier on the joints than jogging or even walking and may be a godsend for them. With a tricycle, the balance issues are negated, for the most part, and the rider can usually place both feet on the ground while seated so if you want to take a breather you can stop and just do it. They even have parking brakes. All of the components have been beefed up including the frame, the axles, chain, sprockets, and bearings. 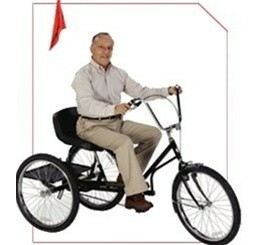 The T-326 is available as a single speed or a 3 speed and has a weight capacity of 600 lbs including the rider. The T-324 is available as a single speed or a 3 speed as well and has a weight capacity of 450 lbs including the rider. Weight Capacity, including the rider is 500 lbs. Husky model T-124C industrial tricycle with 3 speed drive system. 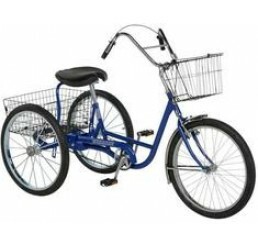 This tricycle is equipped with a Shimano Nexus 3 speed coaster brake hub and a 3 speed grip shifter. Frame is made of combination hi-tensile steel and chromoly. 24 x 2.125 heavy duty wheels with industrial sealed bearings and 11gauge spokes. Tubes are 3mm thick thorn resistant. 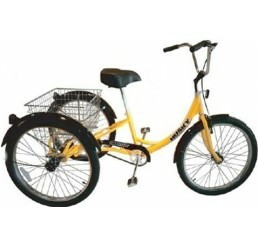 Equipped with a rear basket 15" x 20" x 9"
Weight of tricycle is 86 lbs.